It has been a busy year! We had some wonderful classes in 2018 and have enjoyed meeting and working with so many of our new friends. David is having hip replacement surgery on January 2nd so we are starting our classes again in late March of 2019. Our schedule of classes for the first half of 2019 is listed below. 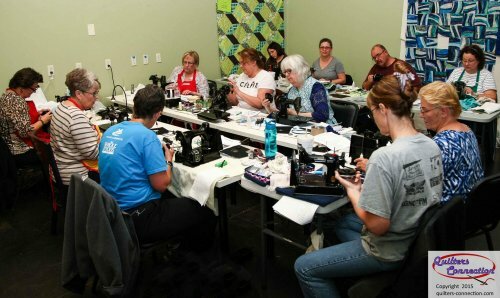 Quilters Connection offers classes on maintaining and servicing your vintage sewing machines, especially the Singer Featherweight and Singer 301. These machines were designed and built to be oiled frequently. Why pay a service professional to do the work when you can have fun and save money doing it yourself! You will learn how to disassemble, clean, reassemble, lubricate, and adjust your machine for maximum performance. If you have a Guild or group and would like to arrange a class at your location, contact us to discuss your ideas and needs. For less than what we charge for servicing your Singer 301, this five-hour class will cover everything the user needs to know to maintain her machine in top working order. Open house in our shop where you can bring a machine to work on, sew on, or just chat and have fun! For less than what we charge for servicing your Singer 221 Featherweight, this five-hour class will cover everything the user needs to know to maintain her machine in top working order.